When you work on manufacturing projects in which the main material is metal, whether in sheet, tube or profile form, delivering the project on time while guaranteeing an appropriate profitability is the most important goal. Lantek endorses this objective and makes it their most important motivation when adapting its software for the purpose of being able to implement the best budgets, the most suitable planning, completion realization of just-in-time purchases, ongoing and real-time monitoring of the execution and delivery of each of the project phases along with their corresponding certifications and invoices. Furthermore, Lantek´s capacity for integration allows you to seamlessly include all of the systems you have available for the management of your company or your production plant and establish much stronger links with your customers and with your suppliers. Count on Lantek to obtain the profitability that you search for in all of your projects, improving in all phases and ensuring that your company improves its productivity and competitiveness. 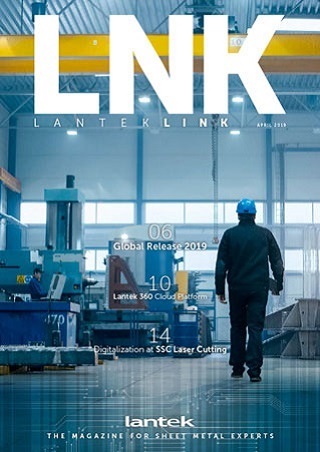 Lantek allows you to manage efficiently from conception to installation of the final piece, from the CNC for each of your metal-cutting machines to the total administration of your company, obtaining absolute control and visibility over the status of all projects underway. Lantek´s capacity for integration will allow you to incorporate all types of formats from external platforms. Complex designs provided by engineering are directly ready to be transmitted for budgeting, scheduling and planning for manufacturing. You are assured that you are handling all of the details of a unique design adapted to the requirements of the end client. With the entire setup of the project in sight, define other goals, deliveries, periods and all other details of the project, adjusting all to the requirements of the client and to your own internal planning needs (shifts, availability of material, and human resources, etc.). Furthermore, the entire set of projects makes up a portfolio of projects, along with the progress indicators with which you operate. Projects oftentimes expand over long periods of time. Throughout the entire life of the project, it is essential to have the capacity to know the revenue, expenses and cash flow for the project so that they may be compared with the budget and the necessary adjustments made. With this information, you can directly update the manufacturing plan, whether manually or automatically, and individually monitor the resources subject to measurement. Generate the requirements of purchases divided by type (sheets, tubes, profiles or consumables), starting with the specifications established in the design. Detail specification of the materials prior to proceeding with the purchase. Monitor the purchase orders corresponding to each project. Select and reserve the materials in inventory, starting with the requests for concrete purchases. Monitor the expenses, comparing them with original plan. Define your own tracing management and quality control system once the merchandise is received. Control each resource and monitor the validity of the production plan. Monitor real costs and compare with the budgets. You can access each aspect of the project at any time to create timely reports on the status of the production. Each of the parties and the elements are organized according to the phases and chapters of the project. Decide which process to sub-contract, depending on its urgency, its importance and its cost. Control the status of each manufacturing order, whether it is being executed in your own plant or in a sub-contractor. Modify your plans based on the changes and revisions of the client´s requirements that may occur and the progress of the project at any time. Control the articles ready for issuance, as well as the inbound deliveries or rejections. Plan the deliveries with details of all of the issuances. Procure the weight of the manufactured elements ready for installation, such that suitable transportation may be contracted. Confirm the proper installation of the elements sent and update the design. Register in the system of all of the project´s certifications, starting with the confirmation that the various sets have already been installed. Visualize the data of each certification per budget article, installed element and execution status, prepared for carrying out the invoicing. Generate invoices associated with the certificates issued in any format: partial, progressive, grouped. Control financial risk at all times thanks to a complete monitoring of the project´s invoicing. Obtain indicator results and extract reports that allow you to compare the project budget with the real costs, grouped by different criteria (budget elements, cost centers, etc.). Lantek allows you to define, plan, control and direct each of the projects that you need, visualizing at all times the real state of each piece of the project objective, whether it be a small project or a complete one composed of a large number of pieces integrated among each other.